Main sources: Prchal, Steven, "Scorpions", in Phillips, Steven& Patricia Comus, eds., 2000, A Natural History of the Sonoran Desert, pp. 265-80, Arizona-Sonora Desert Museum Press, Tucson, pp. 291-3; Milne, Laurus & Margery, 1980, The Audubon Society Field Guide to North American Insects and Spiders, NY, Alfred A. Knopf; Werner, Floyd & Carl Olson, Insects of the Southwest, 1994, Tucson, AZ, pp. 85-7; Attenborough, David, 2006, Life in the Undergrowth, Princeton University Press; and the Tree of Life website cited on our front "Insect" page. Scorpions are the most ancient known arthropods. The earliest scorpion fossils -- dating from the Silurian Period of the Paleozoic Era and 430 Million years old -- were aquatic (with gills) and some were 3 feet long or even more. See, for example, the Eurypterida (thanks to UC Berkeley!). Possessing a firm external skeleton with jointed legs which could move on land as well as in water, these creatures had an initial advantage in occupying the land. The cephalothorax is covered by a carapace, on which are located a pair of median eyes and from two to six lateral eyes at the front corners (see above). This is true except for certain eyeless species. The abdomen has 12 segments, the first seven of which are clearly visible on the photo above, while the last five segments constitute the "tail", on the end of which is the telson -- the bulbous structure containing the venom glands and the sharp, curved aculeus or stinger (below). While scorpions with their exoskeletons had the initial advantage for coming on land, the associated requirement for periodic moulting in order to grow limited their potential size, and once the vertebrates became terrestrial -- my 300 MYa --scorpions became smaller, and the evidence suggests they became nocturnal, developing projecting sensory hairs on the pedipalps (where there are air-vibration-sensing hairs), ground-vibration sensors on the leg-tips, and some unique, specialized chemoreceptor organs under the body called "pectines". With their multiple eyes, they can sense movement in any direction, and are formidable hunters. 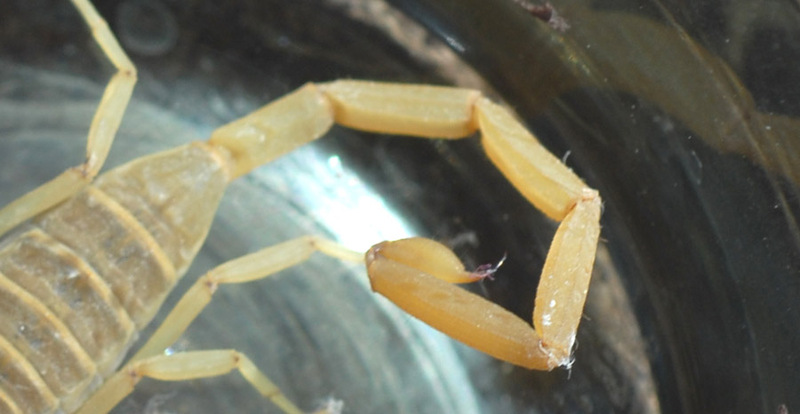 Their exoskeletons retain water so well that some species survive in the hottest deserts. They are highly sedentary, and some species can go without food or water for long periods of time. They do prefer relatively high-humidity locations, and in winter, warmer ones, for example under rocks. They can move surprisingly fast and energetically, and are active mainly at night. They fluoresce strikingly in ultraviolet light, a phenomenon whose functions if any remain unknown. During the summer, they give birth to live young who climb upon the mother's back and reside there until their first molt. Some species live up to 12 years. Below, this particular Bark Scorpion (Centruroides exilicauda) was (fortunately for us) seen -- and photographed -- crawling across the very low-sloping ceiling of the loft in La Margarita (a house rented by Saguaro Juniper members near the Teran Wash confluence), directly above an occupied bed in a darkness that chanced to be illuminated momentarily by a flashlight, October 10, 2002. 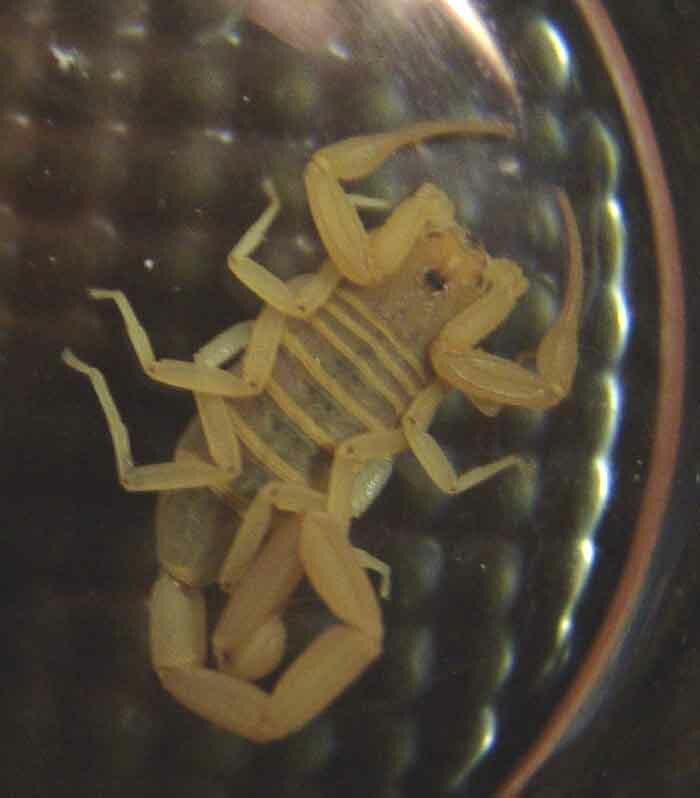 The Bark Scorpion is the only one of the three species of scorpions found in our Arizona Uplands which prefers to climb, including "negative geotaxis" -- upside-down orientation, as exhibited by this one. This is also the one North American scorpion whose venom (a complex mixture including neurotoxins) is considered dangerous to human life (more dangerous kinds however are found in South America and the Middle East). 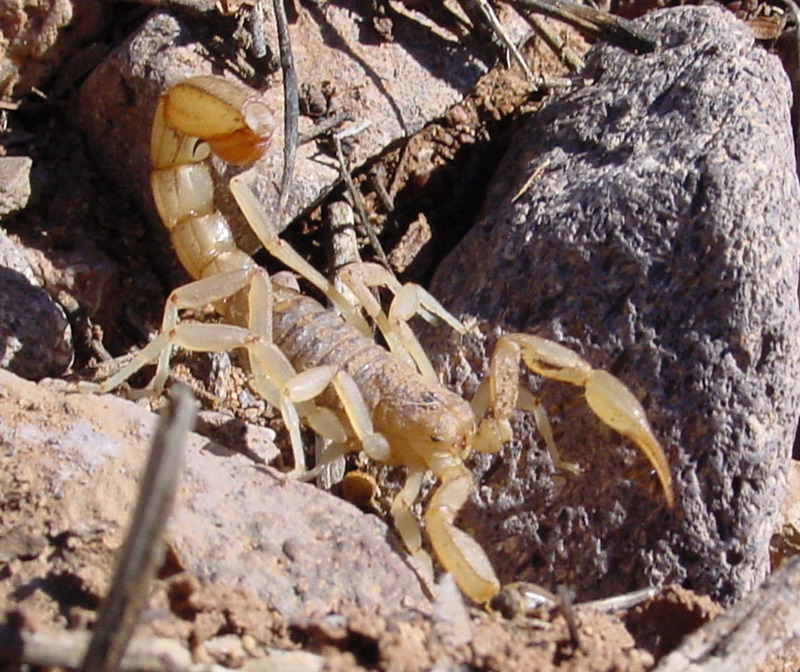 Bark Scorpions are also unusual in sometimes gathering together in large numbers. As indicated by their name, their climbing often takes them to refuge locations under the bark of various trees. 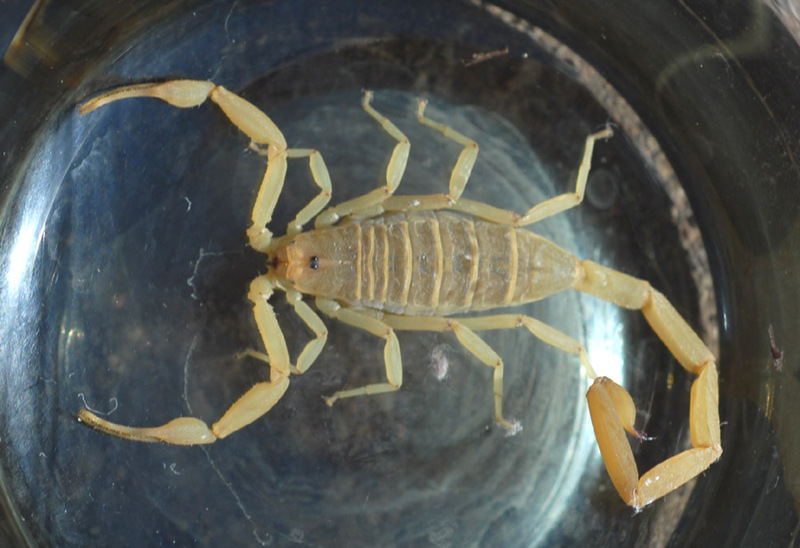 Bark Scorpions are straw-yellow in color, and their pedipalps and tails are distinctly more slender (less bulbous) than those of our other two desert scorpions, discussed further below. The one above was about 2.5 inches long, including coiled tail and pedipalps. In the image below, note the long, gracile form of the pedipalps, and the long slender form of the tail. This full-grown individual was encountered in a Cascabel bathtub on April 24, 2008. Nobody would enjoy being stung by this obviously healthy specimen, but small children and the elderly could be life-endangered. 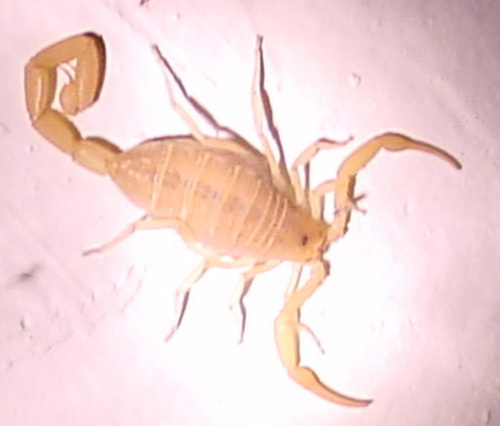 Here below are images of two more Bark Scorpions found in the same building at various times. The one at right particularly highlights the Bark Scorpion's slender tail, in comparison with the Stripedtail Scorpion. Click on each image to enlarge it. 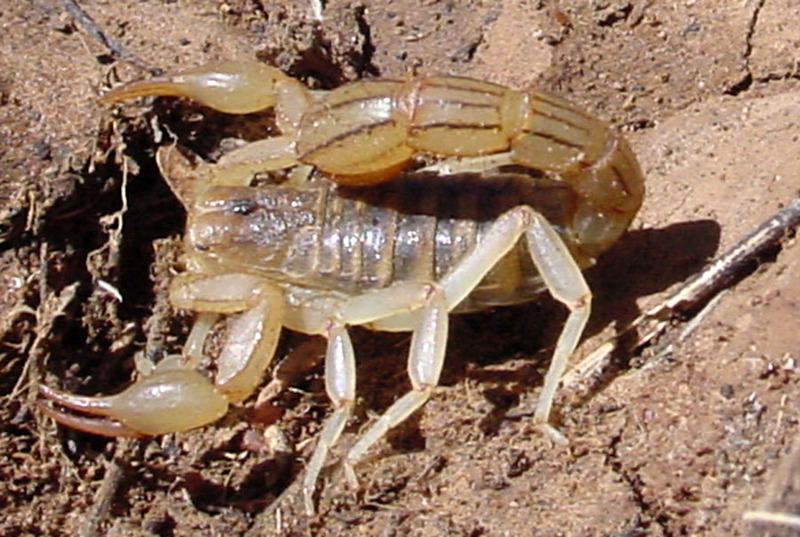 The Stripedtail Scorpion (Vaejovis spinigerus) is roughly the same overall length as the Bark Scorpion (2.5 inches or a bit larger), but its body parts are definitively bulkier. The striped tail is thicker, the body broader, the pedipalp pincers much more swollen and the arm-parts thicker. Its body color is also darker. This one below was exposed under a rock in lower Hot Springs Canyon on September 13, 2002. These are known as "ground scorpions" because they are most often found under rocks and in moist places, as the ones shown above, revealed under rocks during rock wedge building a few days after rain. Below is another image of the same animal. 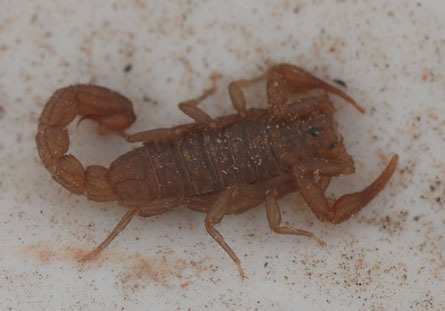 In this image the contrast of the Stripedtail Scorpion's tail shape with that of the Bark Scorpion is especially clear. They are the forms most commonly encountered in our area, and while their stings are painful and cause swelling, this usually subsides within a few hours. Below, images of a very small (about an inch long) Stripedtail which stung Margaret McClelland several times on her inner thigh in lower Hot Springs Canyon on April 23,2008. Click on each image to enlarge it. Below, see the very moderate results of the several stings this scorpion delivered. Margaret reported that while the initial stings were quite painful, this did not last very long, and when the photo was taken the morning after only these bruises remained evident. 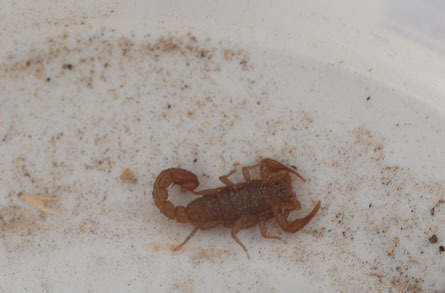 There was no swelling, and while the initial pain ("a sharp burning sensation") was typical for scorpion stings, the inflammation and convulsions that occur with Bark Scorpion stings was entirely absent from this event. (See Resh & Carde 2003, p.1024). We're hoping not to have to report instances of this latter array of symptoms on this page, but the animals are numerous enough in the Cascabel area that people have been stung by them and we will always worry about it. The Giant Hairy Scorpion (Hadrurus arizonensis) -- not shown here (we have no images) -- is more than double the size of these other two (up to six inches long), and is much rarer. It is a deep-burrowing ground scorpion which builds burrows that follow the moisture line. It feeds on other scorpions and even lizards, and its venom is no more painful than that of the Stripedtail. Scorpions in turn provide food, not only for other scorpions, but also for a variety of birds, lizards, snakes, and small mammals.